I'm looking for similar dashboard for RAM and CPU. Can you send me the Metrics info how you writen your syntac of it, plz? No problem, here are the queries I've got for those two dashboards. Little request ... I want the name of the clients also ... I've tried to modify the syntax, but I can't get it to work. It shows me the client name, but pc name stays the same everytime. I'm not an expert in sql but managed to do it. Complexer stuff like graph I really also like, but can't it to work (nor understand) ... any tips? Is there a way to create a graph of CPU from a server? I think you can use h_computerstatshourly ... but thats hourly. Can you create a realtime graph with h_computerstats? I also see that in table "computers" you also have cpu and memory stats ... maybe an idea? Can you help me on the way with 1 server? 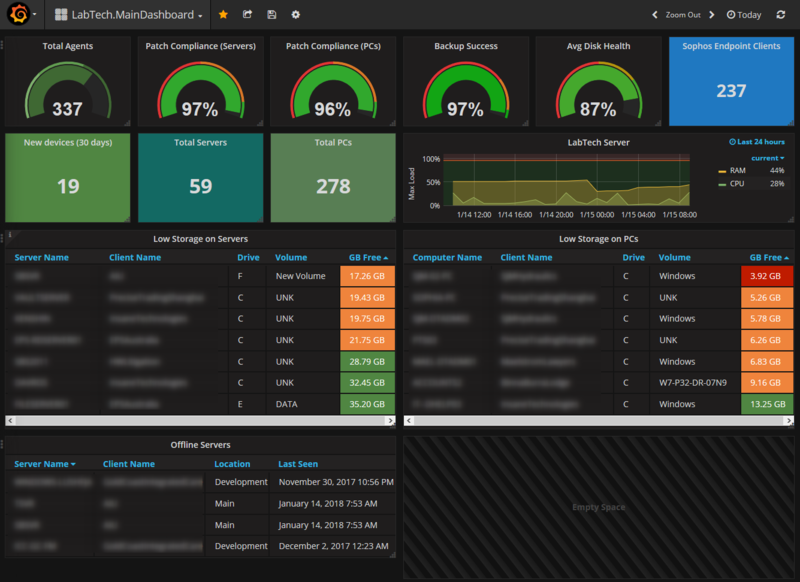 Hello all, long time lurker here, but I want to share my dashboards and panels. I installed latest Grafana straight from the source without the data-sqldb-datasource. They have just released support for MySQL as datasource so I just went to work and I think I kind of nailed it. 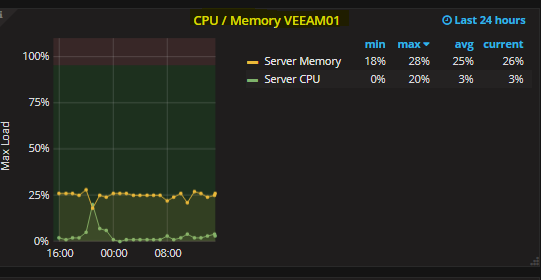 I have panels that show graphs of CPU/ Memory, network trafic , tickets , alerts and more. Most of my experimental stuff lies under the Snippets file, it is there where most of the dynamic stuff is. Please refer to http://docs.grafana.org/reference/export_import/ on how to import a dashboard. Many thanks for the examples ... really appreciate it man. Question1: how can this be? Question2: can you add 5 servers in 1 graphs when selecting multiple servers? Question3: how do you add the dropdownbox on top selecting this servers? Question4: when cpu graphs is showing there a a lot of line the last minutes and before less lines/points. Why is that the last minutes there are a ton of values? (like in printscreen from 13:50 till before 14h 4 points and then around 14h 30 points and the from 14h till 14:10h 1 point and then from 14:10 again a lot op points / values... How is that? Question5: when I look in h_computerstatshourly for a server I can see cpu and memory .. ok ... but the values I see there are different. I have a Exchange servers with the last week around 90% memory usage. When I open computer management in Control Center I clearly see (right bottom) that memory usage is 89% ... When I look in h_computerstatshourly and daily those vallues are not in there ... values go from 4% till maybe 16% ... so not accurate. When I login to that computer and open TaskManager it showing dat 98% memory is in use, so those stats in that table are not accurate and I don't know where there are comming from. Do you have any idea? Question6: I tried to use your CPU template and add servers to it. So I modified the computerid everytime to the desired id. So I added for example 5 metrix code and changed the computer id everytime. But all the vallues in that graph for those 5 servers are the same ... It appears that he doesn't give me 5 different graphes... Any idea? Happy you liked it. I wanted to post this so I can get some input on everything and also make some more progress and have a discussion on this, since Automate lacks a good dashboard function. For templating queries: Templates Query : There are 2 queries in the text. or it might be wrong from my side of the query. Still working out how this works and how it affects the dashboard. There are several places this one kicks in. Both panels and/or the dashboard. It must be set per dashboard though, so it does not affect everything. Question 4: Could be with the refresh rate of the dashboard. In the top right corner, check if it is set on refresh every x minutes. Change to 30 minutes, and check how it affects trhe curve. See if thats related to Question 5. Question 5: Noticed that too, could be that it is counted from CPU time, and not in %, which might explain the numbers. Question 6: Related to question 1 and 2. I treated the templating thing when it comes to repeating panels as "Nice to have", and hope it will be better soon. With the hard coded on the top of the dashboard, copy the JSON and paste it in a another panel, edit the Computerid to what you want. That works for me. See screenshots below. The templating is what I try to figure out, on why it is not giving correct values. Fort the values on panels with the same metric and same result, I am not really sure why it is that way. Copy the text that show up. After you done that, add a new panel and then paste that in the same way. It dont matter what type of panel you make, it will be overwritten. Just wanted to keep you up to date about the problem about the values in h_computerstatshourly and daily ... and the differents between the history panel. Oh man this is so stupid ... the only value that is inverted is the MEM ... every other value is the used value ... but the MEM is wat is left. So for calculating you must do 100-MEM = memory in use. Yes about the same graph for every CPU for the last 30 min is unexplainable ... I did was you proposed in the first please, but still no result. Nice tip on the Memory thing. I solved the duplicating problem on my end. Copy and paste the code, and change the computers to yours. Import this on any panel, as I described in earlier post. I think it is how the display options are setup on the graph. Compare your settings with those in my panel. Updated my dashboards a bit to reflect some changes made, most importantly, the graphs for multiple devices and memory load. Just tried to use your dashboards but somehow can't get them to work. When I import the alert.json file it only shows some of the panels that are specified in the .json file. Also it does not pick up any data, all blank panels. I am new to the Grafana and not a mySQL guru for that matter. What I am looking for is to make some sort of Dashboard that shows only the most critical alert, for example a "single stat" that shows missed heartbeats to servers. Normaly I would like that to be grey and when we get 1 or more missed heartbeats I would like it to turn red. As it is today we have it configured so we get a e-mail when we have missed heartbeats. My thoughts is to have 1 or more screens placed around our office so we visually get alarms. I shall see if I can help you. Alerts-panel: Shows Error and Warnings, so if you get "No data to show" it might mean you have no alerts in your system. Server Agent Offline-Panel: This shows if a agent and on a server has lost contact the last 5 minutes. You can try this one by stopping the service. Low HD-Panel: An entry shows up when a HDD has under 8gb of space left. On github repository all json under Dashboard are one dashboard for each file. So basically, there are 4 dashboards. Details: Health Scores and devices that need reboot. Statistik: Singlestat panels, with various panels and metrics. Alerts: Error and warnings, offline LTservice and low disk. 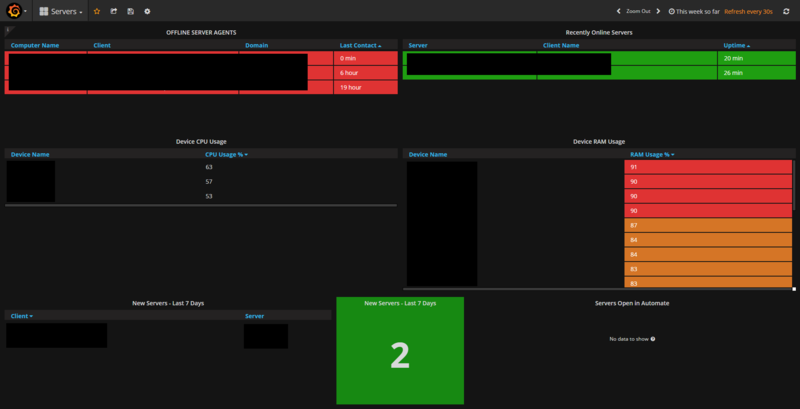 So if you only imported the Alert.json you only get 3 panels: Server Agent Offline, Alerts and Low HD. I hope you changed the datasource to your own in the SQL Query under metric for the panels. Btw, are you from Sweden? Yes I am, I saw that you where as well. There was Swedish typing in the files. Okey nice to have some explanation. I will check and see of I can generate some error. Updated the snippets Dashboard - Which is my "playground" for testing out queries and so forth. Thought I'd give this a whack. I just used the built in MySQL database connector, it works. ClientId ='1' is where all new agents go and ad-hoc agents go. Devices related to clientid 1 are IGNORED. Updated with a few tweaks. You will need to install golang and the github client to get started. The 'go run build.go setup' was rather critical as the build process couldn't find files until I had done this. This last stage took for ever on my machine. Node.exe ate cpu for the best part of an hour. Just leave it run. Once all this finishes, you will have a compiled working copy of grafana 5.0.0 (beta) with a data source of MSSQL available. 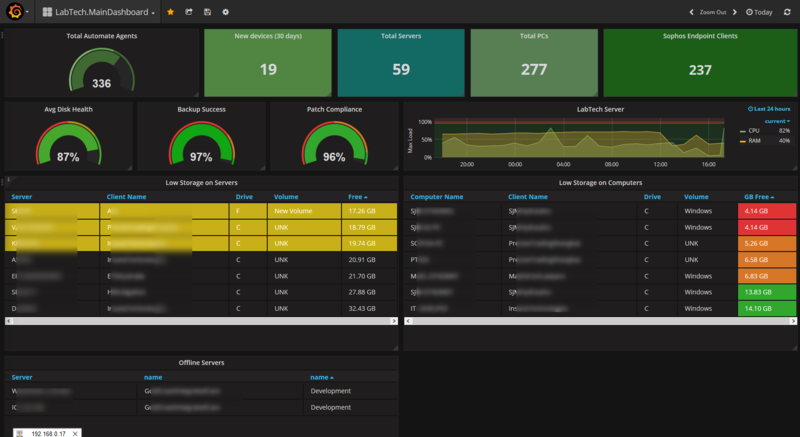 Been trying to figure out a good way to monitor Virtual Manager from Grafana. I would like to get CPU percentage per core as a graph. That gives me a general view based on latest data, but no historical values. (RAMmb - OverallMemoryUsage ) / RAMmb *100 AS "RAM Free %"
Been checking through the DB and cant see where there is a link between computers and their installed AV. Does anyone have a query for that? I effectively want to have a count and list of devices without AV and a pie of the AV breakdown across devices.